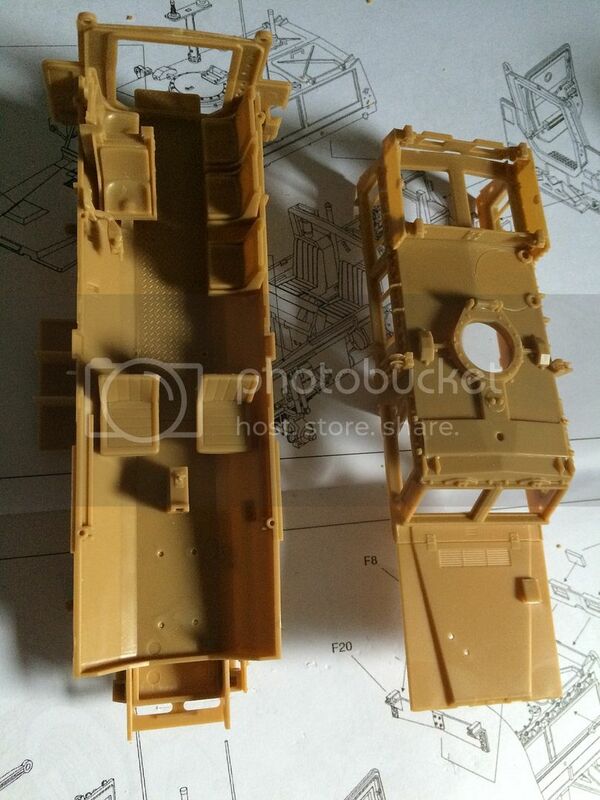 This will be an OOB build with just some extra stowage from the spares box added. And maybe scratch build seat-belts. 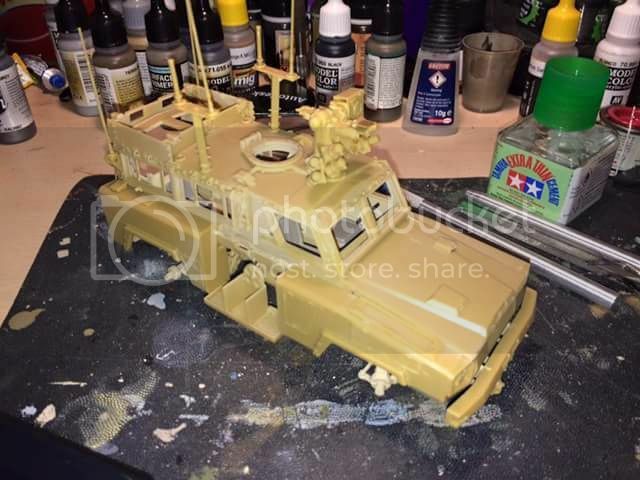 That Meng Cougar does look sweet....it's on my "must get" list. Andre, how is that anti slip coating made? Great to see the builds in progress. I will get started on mine in a couple of weeks. Hi Jesper, I used Rust-Oleum Terra Cotta Spray. This product is great. Thanks for the quick answer. I have never heard of that before. I will have to check if my LHS has it. I don't believe that the Canadian RG-31's had non slip on all of those surfaces. Perhaps on the roof, but certainly not on the hood or the side stowage bins. I am still waiting on the Panda Cougar Jerrv to be released so that I can build my Canadian EROC version. Alex, I did the non slip coat based on great Ken's RG-31 walkaround. The non slip coat is present on hood and side stowage bins. I recommend this walkaround. Interesting. Never noticed that in the Real Model EROC walk around. I'm in! I will post pictures of the kit with stamp date later this evening, heading out to pool with my family. I will be building the 1/35 Panda Cougar 4x4 as a vehicle from the 173rd Airborne. Apparently from the reference photo's I found, they borrowed Cougars from the Marines, so the vehicle will have the Marine "USMC" and serial number on the doors and manned by Army soldiers. Ok, here is my entry. Pete make sure you are careful when fitting the upper hull and lower hull. Almost everyone on here who has built it has experienced at least some sort of issue getting the upper hull, upper hull interior inserts and lower hull to fit properly. Thanks Alex for the tip. I saw that issue while dry fitting the two parts. Here are a couple of the reference pictures I found on the net showing the borrowed MRAP's from the USMC to the Army. Does anyone, expecially the Canadians, know the radio models used in RG-31 in Afghanistan? Here is the beginning of the "comm's" for my Cougar. Here is the CPU and DAGR for the FBCB2 all cabled up. Behind the CPU is the SERIAL INTERFACE ADAPTER DEVICE (SIAD. It's used to interface the FBCB2 with the radio. Here is the AN/VRC-110 wired up. Still need to scratch build 2 PRC-152's to place in the mount and add the coax cable from the radio to the mount. Not 100% sure, but I think that the box next to the radio is some sort of distribution box or something like that. Wow! Impressive comms wiring. Looks awesome. What are you using for the white wire? Thin electrical cable? I use wire wrap wire for most of my wiring. You should be able to pick it up at any local electronics store. I got a spool of black, red, blue, and white at a place called Radio Shack here in the states. Thanks, Pete. I know the place from my time in the U.S. We have something similar, so I will see what I can find. Pete, I'm impressed with the details of connexions. UPDATE: Interior is finished and about to close her up. Working on the turret right now. Looks absolutely awesome, Pete. Great interior. Nice lived in effect and the wiring forthe radiosis excellent! A pity to cloe it up.